Let me work this prayer candle for FIVE days to bring you steady work, a new job, better business and/or more customers! This is a great deal-I purchased these candles from a botanica in Austin, Texas and I can't WAIT to work them for my clients! 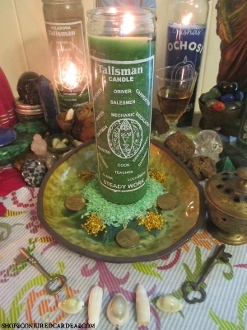 I will dress you candle with the proper oil formula, according to your needs, fix it with the proper herbs and curios and work it on my altar for 7 days.